The 2018 Giller Prize will be announced November 19, and we're pleased to continue our conversations with the finalists and our contest (to the left) where you can enter for a chance to win the shortlist! 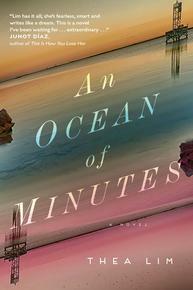 Today we’re in conversation with Thea Lim, author of An Ocean of Minutes. Trevor Corkum: How does it feel to be a Scotiabank Giller Prize finalist for the first time? TC: An Ocean of Minutes is a moving, time-travelling tale set during a deadly flu pandemic. What was the most pleasurable part of writing the book? I was constantly trying to answer entirely unGoogleable questions—what sort of hazmat suits did people wear in 1980? What would have been considered a faux pas when it came to race? Did people rack up as much credit card debt in 1981? I loved the excuse to visit Buffalo and Galveston, fascinating and ghostly cities that get very little spotlight, despite their cinematic nature. Though I finished writing the story several years ago, I still think about the porches in Galveston, blue-painted to ward off the haint; the endless gulf; the Ferris wheel they’ve suspended over the sea; Buffalo’s City Hall, looking like it came straight out of Gotham; the empty department store windows still draped in peach curtains; the hollowed factories now becoming something else. TL: I filled this book with high-concept horrors: a viral flu, stolen time, indentured labour. But in writing it I was trying to work out much more banal things: how do we love each other, knowing that one day everything will end? How do we hold on to the things we’ve loved, to our pasts, without losing our present? How do we solve that most boring and tragic of human problems, the fact that, as Andrew Solomon says, “time passes, and what has been will never be again”? But in writing it I was trying to work out much more banal things: how do we love each other, knowing that one day everything will end? How do we hold on to the things we’ve loved, to our pasts, without losing our present? I would love to say I wrote this book because I have the answer to these questions, but most writers will tell you that we write about what we’re haunted by, what we’ll never figure out, as a way of outsourcing these problems to other people. Sorry. TC: The Giller Prize recently celebrated its 25th anniversary. Can you talk about a previous winning title (or finalist) that you’ve enjoyed, or that has inspired you in some way? TL: I've been reading Alice Munro since I was a teenager, but it was only after I became a writer that I fully grasped her glory. Any Canadian writer who writes about time has to be, on some level, influenced by her. I've been reading Alice Munro since I was a teenager, but it was only after I became a writer that I fully grasped her glory. Any Canadian writer who writes about time has to be, on some level, influenced by her. No one time travels like Alice: into the awful fixity of the past, and into the imagined, hoped-for future—that then vanishes in a such an exquisitely painful way, when she tells us, with her brutal yet comforting honesty, about what really happened. They stayed indoors except for the one day a week when they travelled to the grocery store, which had been commandeered by five army reservists who doled out freeze-dried goods to ragged shoppers. The reservists had taken it upon themselves to impose equal access to the food supply, partly out of good-ness and partly out of the universal desperation for something to do. One day, the glass doors were locked. A handwritten sign said to go around the back. The soldiers were having a party. With their rifles still strapped on, they were handing out canned cocktail wieners, one per person, on candy-striped paper dessert plates that looked forlorn in their huge hands. Ted, the youngest, a boy from Kansas who had already lost his hair, was leaving for a job in the future. He was going to be an independent energy contractor. There was another sign, bigger and in the same writing, on the back wall: 2000 here we come! It was a rare, happy thing, the soldiers and the shoppers in misfit clothes, standing around and smiling at each other and nibbling on withered cocktail sausages. But just that morning, the phone had worked for five minutes and they got a call through to Frank’s brothers, only to be told it had been weeks since the landlord changed the locks to Frank’s apartment, back in Buffalo. The landlord was sympathetic to Frank’s predicament, but he could no longer endure the absence of rent. “But what about my stereo?” Frank had said. “What about my records? What about Grandpa’s butcher knife?” His voice was small, then smaller, as he listed off everything that was now gone. Excerpted from An Ocean of Minutes. Copyright © 2018 by Thea Lim. Excerpted by permission of Viking, an imprint of Penguin Canada, a division of Penguin Random House Canada Limited, a Penguin Random House Company. All rights reserved.